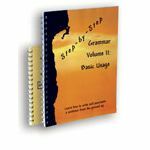 Step-by-Step Grammar is always discounted at Schoolhouse Publishing Homeschool Store! Step-By-Step Grammar is the best grammar program we've seen! Written from a Biblical worldview, this program will give your children a firm foundation without wasting time. One concept is introduced at a time, and all the practice sentences contain only the elements learned - no extra words. 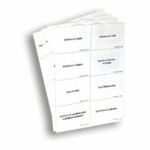 Learn classic sentence diagramming in a simple, straight forward manner. There are two volumes: Volume 1 focuses on basic grammar, Volume 2 teaches pronunciation and sentence construction. There is a separate Teacher's Key available. Buy together to save. What I like: I am using these this year for my 5th, 8th, and 10th graders. Step-by-Step was recommended by our Spanish teacher, because a solid grasp of grammar is absolutely essential to learning a foreign language (seriously!). My daughter was totally lost in Spanish class because she didn't have a solid grasp of grammar. We are using this program, it is helping all of my kids tremendously! It's so easy to use. For the first time in my life, I'm even learning how to diagram sentences. It's actually fun - and my kids actually said, "I like diagramming sentences. It's like solving riddles!" So, yes, I really, really like this program!